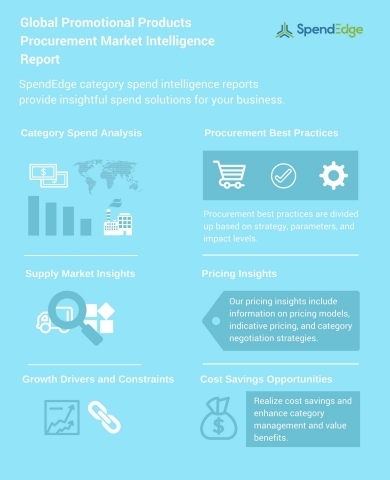 LONDON--(BUSINESS WIRE)--Global procurement intelligence advisory firm, SpendEdge, has announced the release of their ‘Promotional Products Procurement Research Report.’ The insights and data in this report provide a strategic analysis of the supply markets, factors influencing purchasing decisions, procurement best practices, pricing models, supplier landscape, and an analysis of the supplier capability matrix for the marketing industry. This report breaks down the data and analysis behind the procurement of promotional products and acts as an all-inclusive guide for making smart purchasing decisions. SpendEdge has announced the release of their Global Promotional Products Procurement Market Intelligence Report.